Sean has advanced post professional training in Kaltenborn-Evenjth concept with advanced hands-on techniques for soft tissue treatment, joint mobilization and assessment. He enjoys working especially with TMJ, neck, back, shoulder and knee patients. He enjoys working with complex patient’s who are committed to getting better. 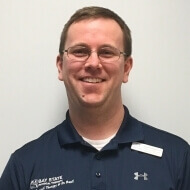 He is a current member in the APTA with membership in the orthopedic, and sports sections. In his off time Sean enjoys hiking, cycling and gardening.